When people hunted the European wolf populations close to complete extinction, isolated groups managed to survive in some places. This heavily impacted the genetic diversity of wolves. The survival of these groups can be linked to the origin of livestock guarding dog breeds in Europe. The map below shows the approximate distribution of the wolf in Europe during its lowest population level in the 1980’s. The same map also shows the regions where some of the most used livestock guarding dog breeds originate from. Several guarding dog breeds are named after the area of origin, like the Great Pyrenean, also known as Patou. What is noteworthy, comparing the map with the current situation, is a division of coexistence-willing countries and countries striving for eradication of the wolf. The need for livestock guarding dogs and other protection measures grew when people had to adapt to the presence of large carnivores, such as the wolf, in their surroundings. These areas had traditionally also shepherds and large sheep flocks. The idea to have livestock guarding dogs followed the believe that a coexistence with these carnivores is the solution. Roughly speaking, this believe was in the eastern, south-eastern and south-western European countries. These countries have lived together with the wolves through history, and are also now more willing to find a solution for coexistence. Traditional livestock protection measures, such as fences, guarding and herding dogs, night corrals and shepherds, have been maintained and revived in these regions. 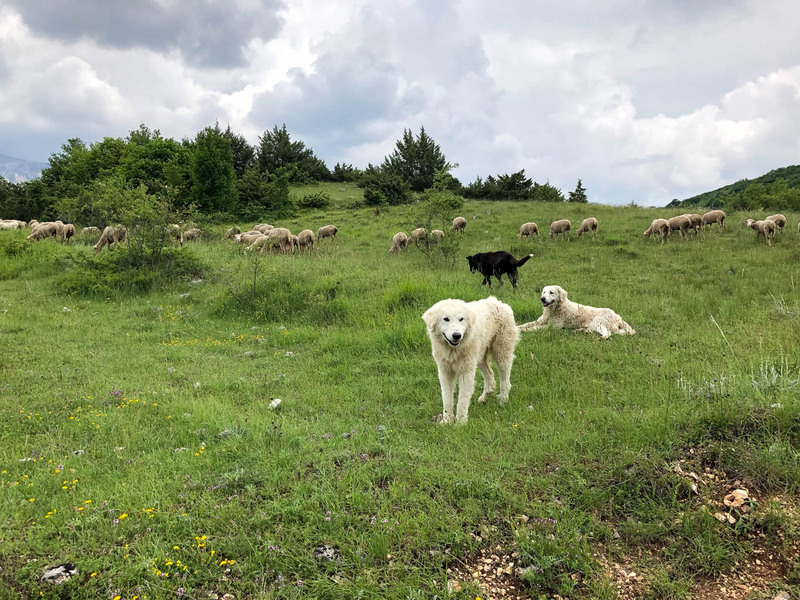 In the western and alpine part of Europe, where people had smaller flocks and less shepherds the focus was more on hunting and eradicating the wolf and therefore the need for livestock guarding dogs was lower. And these countries even today often claim that the only solution is killing, now that the wolf returns. Yet it is widely known that proper livestock management is more effective than killing wolves. Experts suggest that Europe currently hosts about 20 000 wolves. Like the other large carnivores, most wolves persist outside of protected areas. The 2014 paper “Recovery of large carnivores in Europe’s modern human-dominated landscapes” from Guillaume Chapron et at., compiled data about the status of large carnivores in Europe. The large carnivores in this context particularly mean the brown bear, Eurasian lynx, gray wolf and wolverine. The paper underlines the success of maintaining and, to some extent, restoring viable large carnivore populations on a continental European scale. The total area with a permanent presence of at least one large carnivore species is constantly growing. Especially the area of occasional presence is expanding. The paper also states that wolves are the most succesful carnivore species in adapting to human-dominated landscapes. Recent reports of wandering wolves in the Netherlands, Luxemburg and Belgium also support this development. What’s behind the comeback of the large carnivores? The current increase of predator population numbers has several reasons. Europe developed numerous pan-European protection legislations and agreements, with the aim of biodiversity conservation, in the last few decades. Examples are the Habitats Directive or the Bern Convention. As a result, the mentioned carnivores are all, to a varying extent, legally protected in Europe. Furthermore, the socioeconomic changes of the last four decades positively influenced the habitat quality of large carnivores. In particular the large populations of wild ungulates are an important factor for the re-establishment. Furthermore, the abandonment of agricultural land as a consequence of the widespread rural exodus contributes to the returning wildlife. Further reasons are the rising supportive public opinion and a variety of context-specific practices simplifying the coexistens of large carnivores and people. The present situation in Europe proves that large carnivores and people are able to share the same landscapes. The large carnivores’ return is also depending on social conflicts, states the study from Chapron et al. For example, in rural Norway there is a social acceptance of poaching that limits the recovery of wolves in Scandinavia. In Austria, poachers shot several returning bears upon discovery. In these areas where the connection and knowledge about the coexistence of large carnivores was lost, practical challenges and economic impacts of the protection of carnivores have escalated into social conflicts. Carnivores have become symbols of wider political divisions between urban and rural populations. This includes individuals and groups with fundamentally different values and interests. Which opinion prevails, strongly depends on the ecological, social, political and economic situation of an area. Austria, Italy, Switzerland, the Netherlands and several other countries in Europe have started to allocate investments in new herd protection techniques, like electric fences. Regions that lost the knowledge of traditional livestock management, will more likely face severe challenges with reappearing predators. One of the solutions that the European Wilderness Society supports, for European wide coexistence with wildlife, is the sharing of best practices and knowledge. 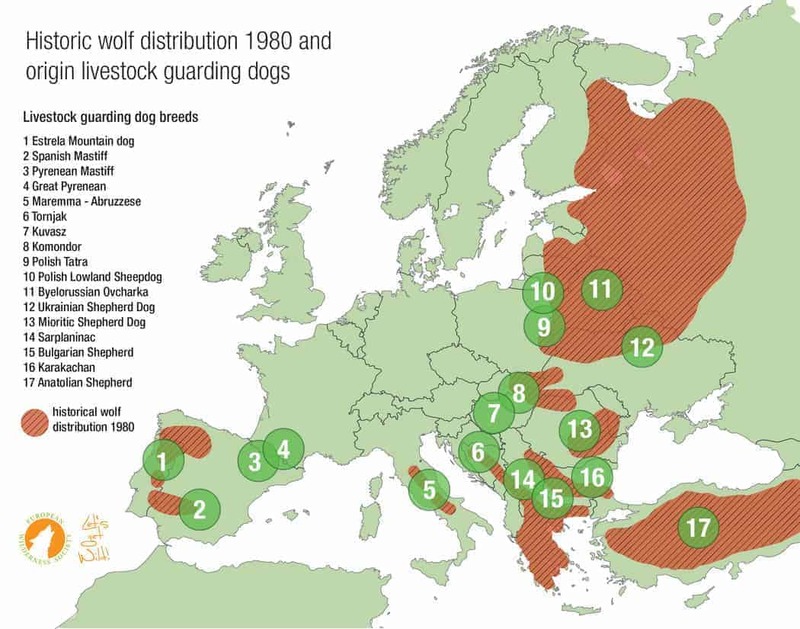 Feel free to share the map ‘Historic distribution wolf 1980 and origin livestock guarding dogs’. Thank you very much for your comment and the information! We will check your source and will update the map accordingly! This map is just supposed to give an overview of the most commonly used livestock guarding dogs. The wolf and Anatolian shepherd dog distribution in Turkey is wrong. Wolf has been distributed in almost all Anatolia in 1980. And distribution is still the same. Please check (Ambarlı et al. 2016). Anatolian shepherd dog called as Kangal dog is mostly in the central eastern part of the country. In the west where the map is marked as Anatolian shepherd other breeds such as Akbaş (Akbash) and Malaklı are being used as LGD. I would suggest to revise the map based on actual data. thank you very much.. we will certainly update the map. You are maybe even interested in contributing to our Livestock Protection Overview with practical tips we plan to publish this winter..
Dear Ann Horsman, thank you for your comment and suggestion to add the Sarplaninac. We will update this! Why no mention of sarplaninac? Dear Gyöngyi Hajnal, thank you for your comment and suggestion. The Kuvasz indeed deserves a dot on this map as well, we will update this. However, the Komondor is also definitely a livestock guardian dog from Hungarian origin. It has been bred to act instinctively to defend a flock fiercely, and is still preferred LGD in different countries around the world. Thank you for the share! As for the breeds as guardians in function from a historic and daily point of view together, there are seemingly utterly misunderstandings in the article. As for breeds of the Carpathian Basin komondor never served as guardian among the Carpaths. It is designed for plain circumstances. Kuvasz that is a fierce and brave guardian throughout the history is not mentioned at all. This breed served and enjoyed great popularity though. Combated wilderness threats and reached high potentials in the field of discussion.